You need the highest protection possible when skiing – the sun is stronger than it appears and is further intensified as it reflects off the snow. Opt for an SPF of 50+ to make sure you’re well protected, and pay extra attention to the nose, forehead and cheeks as these are prone to burning. Try: La Roche-Posay Anthelios XL SPF50+ Melt-In Tinted Cream , this water resistant high SPF sunscreen not only offers optimal protection, but is also tinted to simulate a healthy glow. If you’re not fan of a hat when skiing, you’ll need to protect your hair from the elements. 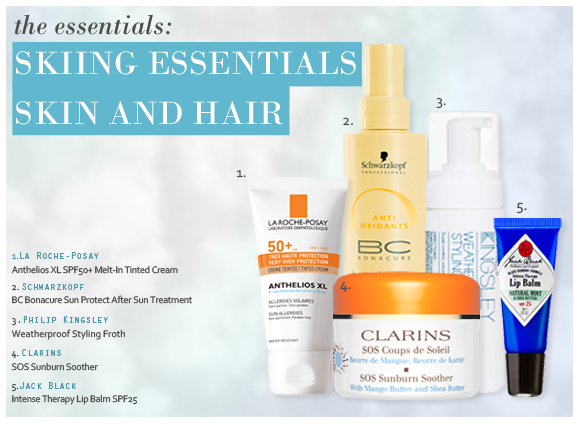 Sun can be extremely damaging to hair, stripping it of its natural oils and causing colour fade. Choose a formulation that will put the moisture back in and protect your hair from further damage. You’ll also need to weatherproof your style what with all of the snow and the wind, so choose a product that will keep you looking polished. Try: Schwarzkopf Professional BC Bonacure Sun Protect After Sun Treatment , an innovative foam spray that repairs, detanges and smoothes the hair after sun exposure, and Philip Kingsley Weatherproof Styling Froth , a protective styling treatment with sunscreens that protects against heat and the weather. Sometimes no matter how careful you are, there’s a little patch of unprotected skin that manages to get burned – and there’s nothing worse than sunburn when you’re trying to enjoy yourself! Pack a product that will help to calm and relieve sun-stressed skin, and will help it to recover a little bit faster. Try: Clarins SOS Sunburn Soother , a 100% plant formula with soothing shea butter and mango butter that restores comfort and suppleness with a gentle touch. Lips really pay the price during skiing. When the cold air is combined with the strong sun, lips can feel really dry and irritable. Don’t lick them, though – they’ll dry out again and so begins a cycle that will lead to chapped, cracked and sore lips. Instead, reach for a moisturising lip balm that will protect as well as soothe lips. Try: Jack Black Intense Therapy Lip Balm SPF25 , this intensive formulation immediately relieves lips and protects them from windburn, sunburn, UV-induced free radicals and chapping. I feel like I was the last person to try this amazing lip balm. But I have an excuse, I live in Portugal and I had never heard of it. I found out about this lip balm online, as one of THE choices by a makeup guru. It doesn't sell in Portugal, or if it does I haven't find it yet, and when I discovered Escentual.com I was absolutely thrilled to see that I could finally try it! It is absolutely the best lip product I have. And I believe that from now on, I will always have one around. I have bad seasonal allergies and my lips are always dry, and to have a product that minimizes that to almost normal, is priceless. You can find some other lip balms less expensive but I'm sure they're not as effective as this one is. I use it at night and put it on again in the morning, and my lips look great and they don't feel dry, at all. It's awesome and I absolutely recommend it. This entry was posted on Thursday, January 19th, 2012 at 8:23 am and is filed under Haircare, Hints & Tips, Skincare, Sun and Tanning. You can follow any responses to this entry through the RSS 2.0 feed. You can skip to the end and leave a response. Pinging is currently not allowed.